Last week we published a letter from Israel's president Ruvi Rivlin, in praise of our Big Brothers program. 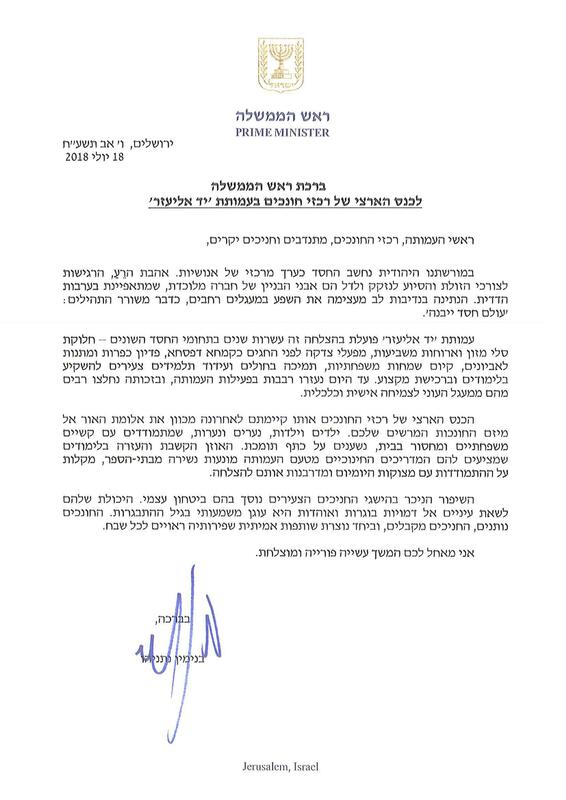 Now we are honored to present another letter about the program, written by Prime Minister Benjamin Netanyahu. In Jewish tradition, chesed is considered a central value of humanity. The love of fellow man, and the sensitivity to the needs of the poor are some of the building blocks of a unified society, which expresses itself in our mutual responsibility to one another. Giving generously to others “spreads the wealth” to wider circles, as is written in Tehillim, “Olam Chesed Yibaneh”. Yad Eliezer has done this successfully for decades in a variety of ways through their programs-food baskets, hot meals, financial assistance for the holidays, weddings and bar mitzvahs, support for hospital patients, and assistance for young students to invest in their educations and acquire a profession. To this day, thousands of people have been assisted through their programs and because of them, have succeeded in breaking out of the poverty cycle and advancing both personally and financially. The National Conference for Big Brothers, which was held recently, shines a spotlight on your impressive program. Youth of varying ages from young boys and girls to teenagers, who are grappling with familial difficulties and absence of parental presence in the home, have a supportive shoulder to lean on. The listening ear and the assistance with schoolwork that your mentors provide for them prevent dropouts and ease these children’s daily struggles, guiding them to success. Their noticeable improvements build their self esteem. Their ability to look up to admired older figures is an anchor during this crucial period in their lives. The mentors give, the students receive, and together they create meaningful and true partnerships whose results are worthy of great praise. I wish you continued success in all your endeavors and this important work.